For most teams, an overtime loss in the NCAA semifinals to the eventual champions would make for a successful end to the season. Most teams, however, aren’t like Stanford women’s soccer. The Cardinal has appeared in five straight NCAA College Cups dating back to 2008, and after winning the national championship in 2011, falling short in 2012 was a tough pill to swallow. The Stanford women plan to return with a vengeance in 2013, with their eyes still set on the ultimate prize. The Cardinal was ranked second in the original preseason poll, only behind perpetual rival North Carolina. Through the first six games, the team has posted a 5-0-1 record, including a double-overtime win over Boston College to open the season. The Cardinal tied perennial power Portland 1-1 on Aug. 31. The team has a new identity this season, as 2012 captains and All-Americans Alina Garciamendez, Mariah Nogueira and Rachel Quon—who had held down the back third of the field for four years—have all departed. The Cardinal’s newly named captains—junior Alex Doll and seniors Emily Oliver, Kendall Romine and Courtney Verloo—will be called upon to fill the leadership void this season. The team will also look to junior Chioma Ubogagu and senior Sydney Payne, who each tallied five goals last season, to continue adding firepower to the Cardinal attack. Furthermore, for Stanford, it’s always about reloading rather than rebuilding. One of this year’s additions includes transfer Taylor Uhl, who was the NCAA’s leading scorer as a member of the Minnesota Gophers last year. Uhl, a junior, has already demonstrated her prolific scoring touch by scoring six goals in the Cardinal’s first five games. Head coach Paul Ratcliffe also brought in a highly regarded class of eight freshmen, five of whom have already recorded starts during the early part of the team’s season. The most intriguing prospect is Jane Campbell, who was the youngest goalkeeper ever called into a full United States national team camp. However, the Cardinal already has one of the best goalkeepers in the nation in Oliver, who has started 58 games over her first three years at Stanford, tallying 26 shutouts and a 0.34 goals against average. Oliver and Campbell have split the first six games evenly (each starting three), but the way Ratcliffe manages his talented stable of keepers will be worth watching as the season progresses. Stanford will face St. Mary’s on Sept. 19 before rounding out non-conference play against Santa Clara on Sept. 22. The Cardinal opens its Pac-12 season at Colorado on Sept. 28. The men’s team is also looking to bounce back from a disappointing finish in 2012. Although the Cardinal capped off its season with a dominating 6-1 win over Cal, it wasn’t enough to earn the team a berth in the NCAA tournament after a rollercoaster season. The primary objective for second-year head coach Jeremy Gunn will be to replace the scoring production of graduated forward Adam Jahn, who is currently playing with the San Jose Earthquakes of the MLS. Junior Zach Batteer (6 goals in 2012) is the team’s leading returning scorer, and he will be joined in the attack by reigning Pac-12 Freshman of the Year Aaron Kovar (3 goals) and Senior Class Award finalist JJ Koval (2 goals). “Players like JJ and Zach are great examples of what we’ve been looking for as progress in the program,” Gunn told GoStanford.com, noting that both players became dangerous finishers through their work over the winter and spring. Junior Drew Hutchins returns to the net for the Cardinal after tallying five shutouts last year. He will lead a back line that includes returning starters senior Tyler Conklin, junior Jimmy Callinan and sophomore Brandon Vincent. Stanford is also working in a group of eight impressive freshmen from all over the country. Forward Jordan Morris and defender Brian Nana-Sinkam have both started three games for the Cardinal while forward Mark Verso has also seen time. The Cardinal has seen solid results in early tests so far this year. Stanford opened its season with a 3-3 tie against No. 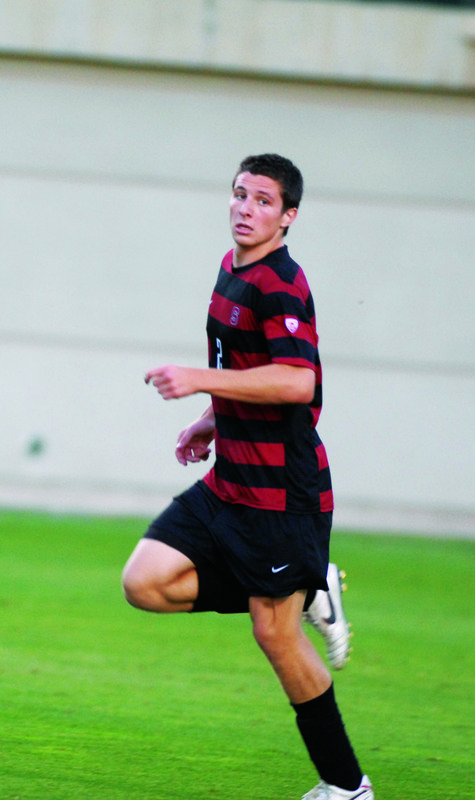 2 Maryland in a match that Stanford led through 85 minutes before the Terrapins recorded a late equalizer. The Cardinal fell to No. 17 Georgetown before bouncing back with a 1-0 win over Bay Area rival Santa Clara and a 2-1 victory against Grand Canyon. Batteer and Koval have picked up right where they left off by each tallying two goals through the Cardinal’s first four games. Stanford has scored five goals in four games, although they were aided by an own goal in the Maryland game. Stanford will need to continue building its postseason resume before it begins Pac-12 play on Oct. 3 against Washington—last season, the team’s inconsistent results early in the season kept them out of the tournament despite finishing third in the Pac-12. Contact Jana Persky at jpersky ‘at’ stanford.edu. Jana Persky is the president and editor in chief of Volume 246 of The Stanford Daily. She previously worked as a sports desk editor, news desk editor and managing editor of staff development at The Daily, and is majoring in Public Policy. Jana is a junior from New Canaan, Connecticut, who doesn't want to tell her mom and dad she likes the West Coast better. To contact her, please email eic@stanforddaily.com.